Each year, there are more than 3.5 million cases of varicella — or the chicken pox, as we commonly call it. It’s a virus that needs to naturally run its course, which means it will last anywhere from five to 10 days (which can feel like a lifetime for kids and adults alike). While it used to be a common childhood illness in the United States, especially in kids under age 12, chicken pox is rarer now thanks to the introduction of the varicella vaccine in 1995. Nowadays, kids get the vaccine when they’re 12 to 15 months old and then follow that up with a booster shot between the ages of 4 and 6. But when your little one does catch a case of the chicken pox, it’s no easy feat to soothe all that itching plus the aches and pains. Sure, you know you shouldn’t let your kid scratch the rash — but what else can you do to ease your poor kiddo’s suffering? From over-the-counter remedies to at-home soothing soaks, here are five ways to soothe a child with chicken pox. The chicken pox virus typically comes with viral-type symptoms, such as headache, fever, fatigue, sore throat, stomachache and muscle aches. When your children are suffering through these discomforts, you can give them acetaminophen (Tylenol) according to the dosage information on the bottle. However, do avoid anti-inflammatory painkillers such as ibuprofen. Taking this can make your child very ill. Plus, children under 16 years old should never take aspirin, as it could lead to Reye’s syndrome, a severe disease that affects the liver and brain and can cause death. Cool or lukewarm baths (not too hot or too cold) with two cups of ground oatmeal blended in (use home-ground oatmeal or a store-bought oatmeal bath packet like Aveeno) can help reduce itching in children with chicken pox. Adding one-half to one cup of baking soda to the bath may also put a halt to the itches. Give your child a bath frequently — every three to four hours — for the first few days of the virus. Tap or pat the itch. Never scratch! This includes when you’re drying your child’s skin off post-bath: Just dab or pat it. Wear loose cotton clothing. This allows skin to breathe. Keep your cool. Use a cool, wet washcloth on itchy areas to calm skin. Calamine is the most common lotion used to soothe itching due to chicken pox; apply it directly to blisters to help them dry out and give skin relief. Do not, however, use calamine lotion on the face near the eyes. You can also give kids over-the-counter antihistamines such as Benadryl to lessen severe itching. Due to its drowsiness-inducing nature, though, Benadryl works best at night. Claritin or Zyrtec may also help diminish severe itching from blisters, and those do not cause drowsiness. You may also discuss antiviral medications such as Zovirax with your doctor; these may shorten the course of the virus. Before you administer any medications, though, check with your doctor first to make sure your child can safely take antihistamines. In order to stave off dehydration, make sure kids drink lots of fluids. This will help the body rid itself of the virus faster. (And yes, they do need to ditch sugary drinks and choose water instead). Scratching varicella blisters can lead to skin and bacterial infections, so make sure to keep kiddo’s nails trimmed to keep him from breaking open itchy chicken pox sores. You can also have young children wear cotton mittens to prevent scratching, especially at night during sleep. Do you suspect one of your kids has caught a case of varicella? You may want to get a professional opinion before treating it as chicken pox. 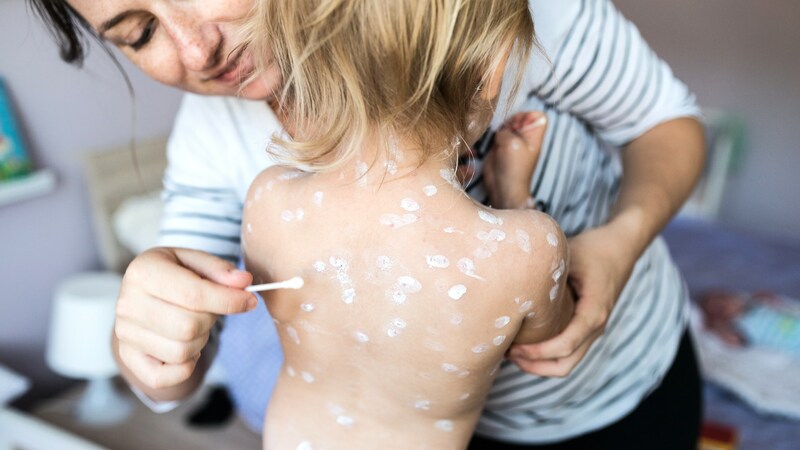 But for those kids who do come down with for-real varicella, you’re now prepared to be a superhero parent, conquering the pox like it ain’t no thing. A version of this article was originally published in November 2011.